Perception-action coupling is discussed in the context of the development of the visual control of posture. 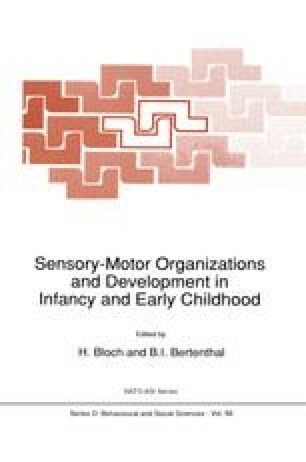 This developmental process is multidetermined and emergent in that it depends upon achieving the necessary muscle strength and coordination of the relevant muscle synergies in conjuction with specific perceptual competencies necessary for its control. It is suggested that more quantitative techniques are needed to answer current questions on the development of visual-motor coupling. Some common principles and techniques used in biomechanical analyses are summarized and their application to the study of perception and action is illustrated in recent studies on visual-motor coupling in infants. A novel and important finding emerging from this new research is that infants control the timing of their postural compensations in response to local environmental conditions prior to learning to control the forces necessary to ensure a stable and successful response.